Imagine being given the name Haskay-bay-nay-natyl, at birth. Nevertheless, the name, which means “the tall man destined to come to a mysterious end,” was given to a baby born in the 1860s on the San Carlos Reservation in Arizona. Because his name was strange and difficult to pronounce, the citizens of Globe simply called him “Kid.” Haskay-bay-nay-natyl was most likely a White Mountain Apache. Eventually, the nickname was changed to the Apache Kid, and he was said to have been the fiercest Apache, other than Geronimo. The Apache Kid learned English at an early age, and began working odd jobs in Globe. Soon, he was befriended by the famous scout, Al Sieber. At that time, early settlers of the Southwest faced numerous raiding bands of Apache and General George Crook had come up with the idea to use Apache to fight other Apache. They began enlisting Apache Indians from San Carlos and other reservations. The enlisted scouts could locate the trails that the hunted Apache traveled. In 1881, the Kid enlisted in the Indian Scouts. He was so good at the job that he was promoted to sergeant in July, 1882. The following year he accompanied General George Crook on the expedition of the Sierra Madre. The Geronimo Campaign of 1885-1886 found the Kid in Mexico early in 1885 with Sieber. When the Chief of Scouts was recalled that fall, Kid rode with him back to San Carlos. 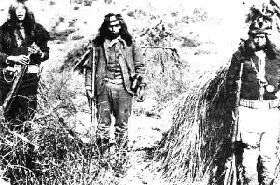 Apache Kid re-enlisted with Lieutenant Crawford’s call for one hundred scouts for Mexican duty, and again went south in late 1885. In the Mexican town of Huasabas, on the Bavispe River, the Kid nearly lost his life in a drunken riot that he participated in. The judge in the case decided that rather than see the Apache Kid shot by a Mexican firing squad, he would fine him twenty dollars. The Army sent him back to San Carlos. In May, 1887 the Apache Kid was left in charge of the Indian Scouts and guardhouse at San Carlos when Captain Pierce and Al Sieber, an Anglo scout, were both gone on business. Though the brewing of Tiswin, a beverage made of fermented fruit or corn, was illegal on the reservation, but the white officers gone, so the Indian Scouts decided to have a party. As the liquor flowed freely, a man named Gon-Zizzie killed the Apache Kid’s father, Togo-de-Chuz. Kid’s friends, in turn, killed Gon-Zizzie. However, the killing of Gon-Zizzie was not enough for the Apache Kid, who then went to the home of Gon-Zizzie’s brother, Rip, and killed him too. When the Apache Kid and the four other scouts returned to San Carlos on June 1, 1857, both Captain Pierce and Al Sieber were there ahead of him. Captain Pierce ordered the scouts to disarm themselves and the Kid was the first to comply. As Pierce ordered them to the guardhouse to be locked up, a shot was fired from the crowd who had gathered to watch the display of events. In no time, the shots became widespread and Al Seiber was hit in the ankle, which ended up crippling him for life. During the melee that followed, the Apache Kid and several other Apache fled. Though it was never determined who fired that shot that struck Sieber, it was for sure not the Kid nor the other four scouts ordered to the guardhouse as they had all been disarmed. 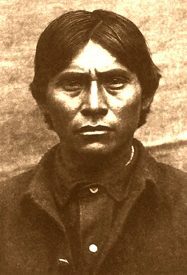 Over the next few years, Apache Kid was accused of, imprisoned for, escaped from or was released from prison for many crimes. It is not certain if he was guilty of these things or not. Some said that he was innocent and actually helped those under attack, but many said he was the attacker. Eventually, the Apache Kid disappeared and was never officially seen again. Some said he died, while other said he went to Mexico to a secret mountain hideaway. The jury is still out as to whether he was a good guy, or a bad guy, and the world will most likely never know. interesting story. I wonder what really happened. I remember hearing about him in school. I wonder too. I think he was a good guy, and I hate to think he was killed as a bad guy.